Orders $75 and up Ship FREE - Orders under $75 ship for $7.95! Freight policy applies to shippable orders, lower 48 states. Oversize (or heavy) boxes may not qualify. We will notify you prior to shipping if there is an oversize freight charge. See Free Shipping page for full details. KTM World - Massive Inventory, Fast Shipping! KTM WORLD has a massive inventory of KTM parts ready to ship. We also place orders with KTM multiple times each day, so if your part happens to be out of stock when you order, we will order from KTM that same day, often in less than an hour. In stock orders recieved by 2pm usually ship the same day. After 2pm orders may not ship until the next business day. The KTM World staff is very experienced and knows KTM's inside and out. We can answer your KTM parts, service, and sales questions! Our Service Dept specializes in KTM/WP suspension revalving with forks and shocks shipped in from all over the country and beyond. 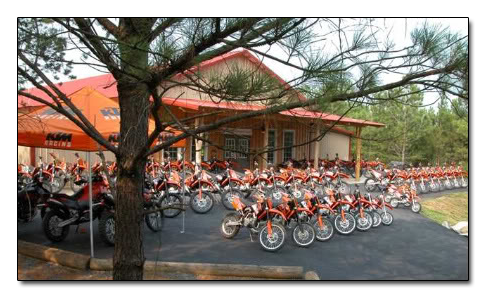 KTM WORLD is the largest KTM facility in the world, open 7 days a week, located on a 1000 acre riding park with 3 MX tracks, a PeeWee Track, camping cabins, KTM rental fleet, and over 100 miles of trails through the North Georgia mountains.